Long regarded as “the Bible of card handling,” Dai Vernon wrote that it is “the finest book on cards ever written.” It is the most analyzed, lionized, scrutinized, and fetishized text among magicians, and for over a century it has never been out of print. I’m of course referring to Artifice, Ruse and Subterfuge at the Card Table, also known as The Expert at the Card Table, and most often referred to in shorthand as Erdnase. First published in 1902, there have been dozens of editions. Some have included supplementary material, such as Dai Vernon’s commentary published in both Revelations and the updated Revelation. Michael MacDougall’s treatise on card handling, Card Mastery, included the full text as the second portion of the book. In the 1980s the Chief Genii, Richard Kaufman, hoped to publish a new version with hundreds of additional illustrations (at Michael Ammar’s suggestion) and annotations by himself and Darwin Ortiz. It was eventually published as The Annotated Erdnase by Mike Caveney without the additional illustrations. David Ben, the Canadian performer, writer, historian, and Artistic Director of Magicana, has produced something similar to what Ammar might have had in mind. The original, as we all know, has 101 drawings “from life.” Mr. Ben has dropped M.D. Smith’s illustrations, but has added more than 750 photographs taken by Julie Eng. These photographs have a pristine clarity, and go a long way toward illuminating every ruse and subterfuge in the book. To give you an idea of the difference made, the moves in the section on “ordinary methods of stocking, locating, and securing” are granted four illustrations in the original. Here there are 69 photographs covering the same material. From now on it will be hard not to recommend this volume to anyone who wants to learn something from Erdnase. Although Mr. Ben has not added any commentary or annotations (those will be contained in a sequel, the second volume of a proposed trilogy), he has done more than merely add photographs. He has rearranged and restructured the original prose in an attempt to clarify the Erdnase system. No text has been added, and little or none of the text has been cut—every time I thought a paragraph or section was missing, it popped up elsewhere. For example, the first 12 pages of chapter one (of the original) are a collection of introductory remarks covering a dozen topics. These remarks have been divided up and incorporated into the sections they are referencing. These types of changes are logical and straightforward and result in a smoother flow for the reader. Also toward that end, long paragraphs have been divided into smaller, more digestible paragraphs. These are the trivial changes; more significantly, the actual architecture of the book has been changed. The text has been rearranged in a new schematic order in the hopes of illuminating the sophistication of Erdnases’s system. For example, the overhand shuffles are separated from the riffle shuffles and placed in a later chapter. This makes sense. In 1902, overhand shuffling was more prominent that it is now. Today, overhand shuffling is all but non-existent at the card table, and relocating it is hard to argue with. Other topics, previously separated, are brought together. For example the various ways to indicate the location for the cut are now in the same chapter as the top and bottom palm descriptions, because they all serve the same function: negating the cut. I found no fault with any of these structural changes, but I imagine they will inspire endless debate among devout Erdnasians. This work is focused only on the science and art of manipulating cards for the purposes of cheating and advantage play. Therefore some readers will be disappointed to find out that the legerdemain section has been eliminated, as that section includes many of the faithful’s favorite moves, including the Diagonal Palm-Shift, the S.W.E. Shift, the Top Change, five Blind Shuffles, and eight Color Changes, including the popular one often attributed to Houdini. The exclusion of these moves (and this entire section) will be sorely missed by many. I do have one complaint concerning the table of contents. The original has headings and sub headings, enabling one to quickly find the location of any move or topic. This volume’s table eschews the subheadings (and there is no index), so if you want to know, say, where the Erdnase System of Blind Shuffles is, you have to page through the book, because it is not in Chapter 3 (“Blind Shuffles”), but in Chapter 7 “Hand Work” (a chapter heading that doesn’t exist in the original). As mentioned, I defend the decision to separate overhand shuffles from the riffle shuffles chapter, but “Hand Work”? As an exercise, if you get your hands on a copy of the book, try to figure out from looking at the index where the shifts or the palms are. Finally, a couple observations that will be complete non-issues for some, but will give others pause. I do not know Mr. Ben well, but I suspect he enjoys a little controversy from time to time, and perhaps the following decisions come from a desire to be provocative. As explained, the text in this volume is entirely from Erdnase, yet Mr. Ben has chosen to list himself as co-author, when none of the words are his—other than a brief introductory commentary and some altered chapter titles. There are many examples in publishing of editors who have had enormous influence on the shape, structure, and even content of books, but I don’t know of any other instance where an editor has promoted himself to co-author, let alone taken top billing. Perhaps Mr. Ben’s intention is that this is the byline for the entire trilogy and not just this volume. That is perfectly legitimate, but as is, it is a bit too ambiguous. As for Mr. Ben’s “co-author,” he is listed, quite matter-of-factly, as E.S. Andrews, a Minnesota-born railroad agent who died in 1922. (This is the candidate that has been put forth by Richard Hatch.) As an attorney, Mr. Ben surely knows too much about evidence and proof to actually believe the authorship question has been definitively answered, so I can only conclude that he is merely courting controversy. But these minor issues do not affect how valuable the book will be to the student. I have not yet mentioned that, as with all of Mr. Ben’s publications, this is a top notch production. The photographs, layout, and design are gorgeous. This book is a pleasure to page through, and is an important and welcome addition to Erdnasiana. It deserves all the praise it is already getting, and will surely create rabid anticipation for the next two volumes in the trilogy. The first of which will present Mr. Ben’s technical notes, insights, and commentary on the material in this volume, and the last volume will flag gaps in Erdnase’s system, and discuss the evolution of certain techniques, as well as include observations on the relevance of Erdnase, both for magicians and advantage players. Perhaps in a century, first editions of The Experts will be as sought after and treasured as first editions of The Expert are now. 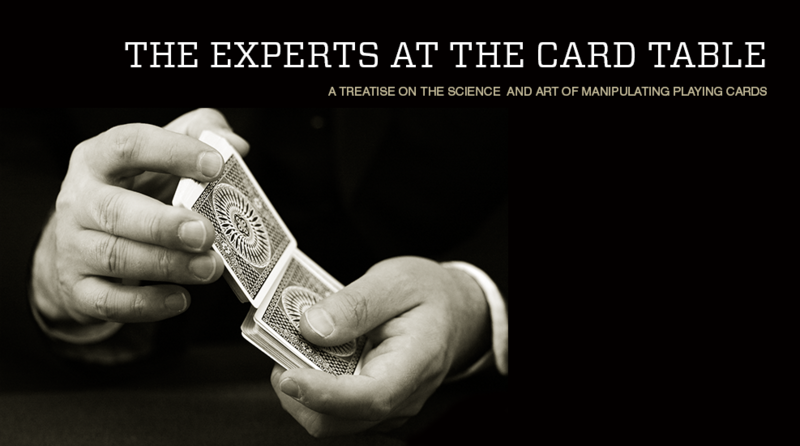 The Experts at the Card Table: A Treatise on the Science and Art of Manipulating Playing Cards * David Ben & E.S. Andrews * 10 1/4 inches square; 231 pages, clothbound with dustjacket, illustrated with black and white photographs by Julie Eng; published by Magicana www.magicana.com $75 plus shipping.